I’ve been doing cosplay repair for a couple years now, and it’s high time to offer some tips. In the time I’ve been doing cosplay repair, I’ve seen a lot of cosplays and, needless to say, fixed a lot of them too. While I’m no expert on cosplay, or costuming and costume making in general, I do know a thing or two about on-the-spot repairs and quick-and-dirty fixes for cosplays when they inevitably malfunction. And trust me, it doesn’t matter whether you made it, bought it, thrifted and modified it, or pulled it out of your closet—stuff happens. Things break, and some doorknobs just stick out a little too far. But while I’m happy to offer my services at cons and cosplay events, and while there are others like General Maintenance who are willing to do the same, there are times when we won’t be around and your cosplay desperately needs a repair or quick fix. Some cosplayers have their own repair kit, or a handler who carries a one (more common with furries), should any problems pop up. However, many others—especially those who finished their cosplay last minute, on which point I feel your pain—often overlook the idea, especially if there isn’t an easy way to carry repair items given the constraints of the cosplay. (This is often an issue with more revealing outfits that have minimal room for pockets, such as Yoko Littner from Gurren Lagann or Ryuuko Matoi from Kill La Kill.) Or maybe you want to build a repair kit but don’t know what sorts of items you would need and what you wouldn’t need. Well, I’m here today to offer some suggestions and recommendations as your friendly neighborhood cosplay repair guy! Read on for some of the items and tools that every cosplayer should carry with them in their emergency kit. Now, let me preface this by saying this is not an absolute or definitive list by any means, and obviously I’m giving only suggestions based on my experience. Also, this list strictly consists of items and supplies that are portable or easily made portable, won’t require electrical outlets (like a hot glue gun), and carry minimal danger and safety risk. A full-size sewing machine obviously can’t be easily or practically carried in a necklace, and a portable soldering iron is a little too risky given that they’re pretty darn hot! So instead, I’ll be focusing on supplies that you can bring around with minimal footprint and effort. And of course, when building your own repair kit, feel free to add or omit supplies as you feel is needed, since not all cosplays are the same and, consequently, won’t always use the same repair methods. Don’t be afraid to get creative in your repair kit, either. If nothing else, let me be an inspiration for ideas for your own methodology to cosplay repair! Remember: your mileage may vary, and of course, feel free to add suggestions in comment form at the end of the article. If you cosplay, you probably will wear a wig—or, at the very least, style your hair to match the character you’re cosplaying. Enter bobby pins. Bobby pins are obviously used to gently pin hair or in a certain area or in a certain direction, and they are also especially useful for securing a wig onto a wig cap. You can also use bobby pins to fix small props onto hair or wigs for cosplay. But those are the obvious, intended uses. Here’s something interesting: bobby pins are versatile tools. Okay, maybe that’s not exactly earth-shattering news; after all, it is possible to pick a lock with a pair of bobby pins, as any Fallout player knows. But there are many times when one of these pins can come in handy. One example that comes to mind is using them as a paperclips. Say you buy several art prints from artist alley and need a way to hold several prints together, but you don’t have a paperclip handy—simply grab a bobby pin. You can also use one as a handy bookmark in your con program book. Whatever use you could think of for bobby pins, it’ll probably excel at that use. And the best part is that carrying extra bobby pins is very easy: simply slide some onto your belt or sleeve or necklace or whatever will fit and you’ve got a handy tool on hand at almost all times. Add to that the fact that they’re cheap and easy to get, and you’ve got one of the most important items to carry in a cosplay emergency-repair kit. These are the cheap multitools of cosplay repair. It goes without saying that both items are useful in more ways then they were originally intended. 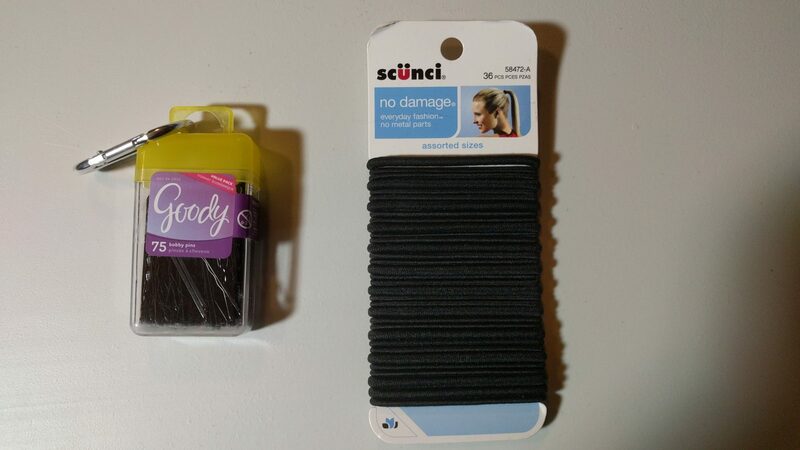 Just as useful and easy to carry are hair binders, which come in a variety of different strengths, sizes, and colors. And just like bobby pins, elastic bands can serve purposes beyond what they’re designed for. Most things you can do with a rubber band you can also do with a hair binder. Got some posters? Roll them up and secure them with a hair binder. Need to tie a bag shut? You get the drill. And with the age-old method of keeping a binder or two around your wrist, it’s easy to always have a hair binder handy. Of course, this is an item that’s useful in day-to-day life outside cons too. It just so happens to be invaluable for the majority of cosplay, especially if wigs are involved. Sewing is one the strongest types of cosplay fixes, though it’s also the most difficult and time consuming. Needle and thread are flexible when it comes to repairing rips, tears, and splits or reattaching things like detached buttons. 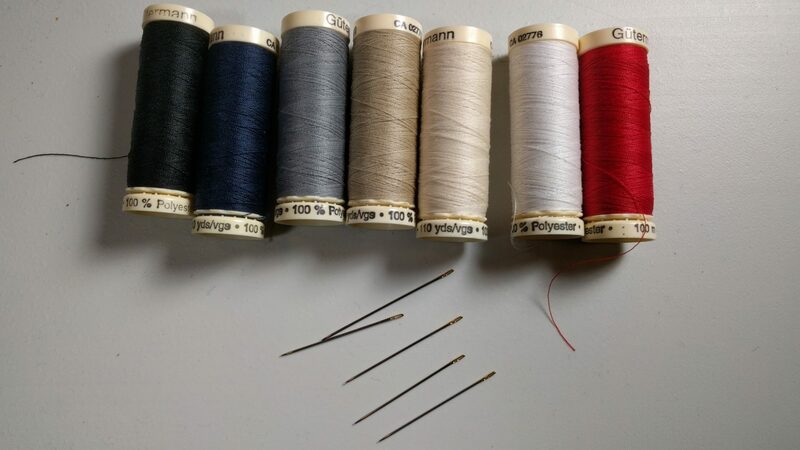 On top of that, even if you can’t carry a spool of thread like the ones pictured below, you can carry a short length of thread on a much smaller bobbin or even stored loosely within your carrying container (or pocket) of choice. Or, if you have the room, get a simple sewing kit with its own container from a fabric or craft store. Don’t forget the needles, either—the one I use, shown in the photo, are easy-thread needles that I found on a trip to the Minnesota State Fair. Unfortunately, I don’t remember what the brand name is, but they’re wonderful needles with a slot on the side of the eye, which makes threading them a simple matter of looping some thread then pulling it in through the slot of the eye. Some of the most commonly used colors for sewing thread and a set of five easy-thread needles. Bear in mind, though, that using a needle and thread does require knowing how to sew by hand. So if you don’t, then you’d be much better off using any of the other quick fixes listed here. Also, though using needle and thread is a strong and at least semipermanent fix, it’s hardly a fast fix. If you accidentally tear a six-inch hole in your outfit five minutes before your time slot at a cosplay masquerade, you might be out of luck unless you do a shoddy sewing job or you’re inhumanly fast and good at sewing. But if you have the time, the fix requires mending fabric or reattaching a button, and you know how to sew by hand, needle and thread are probably the best method to make a strong fix that’s portable enough to carry inside an empty pill bottle. Large to small, safety pins come in any size you could need. Safety pins are very straightforward, so I won’t need to spend a whole lot of time explaining them. 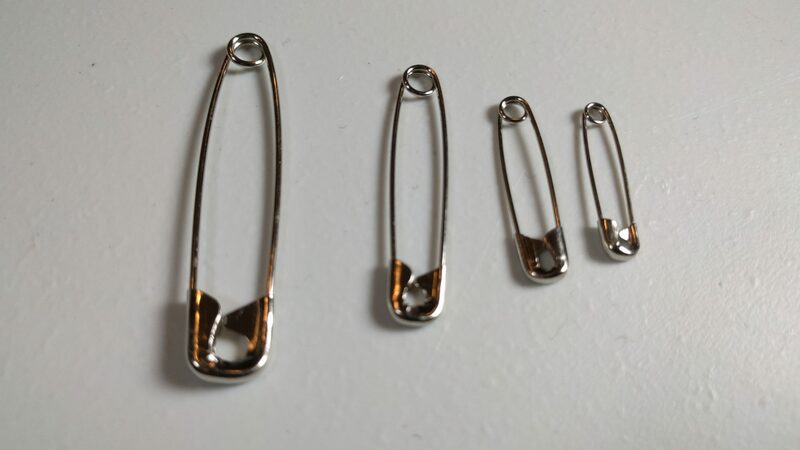 Unlike the items above, which have one main use but come in many different forms, safety pins are about as simple as you can get. Combined with some glue, you can secure certain props to your outfit. Or if you have a tear and don’t have time for needle and thread, or you broke a zipper and can’t fix it, you can use a safety pin or three to keep otherwise separate bits of your outfit together. And like everything else listed, safety pins are easy to carry in quantity. For example, if you’re wearing an elaborate dress, you can store some spare safety pins on a loose but unseen part of your outfit, similarly to how spare buttons are sewn into the placket of a button-up shirt. Or you can carry a small number on a key ring and attach it to your outfit with a D-ring, a carabiner, or another safety pin. 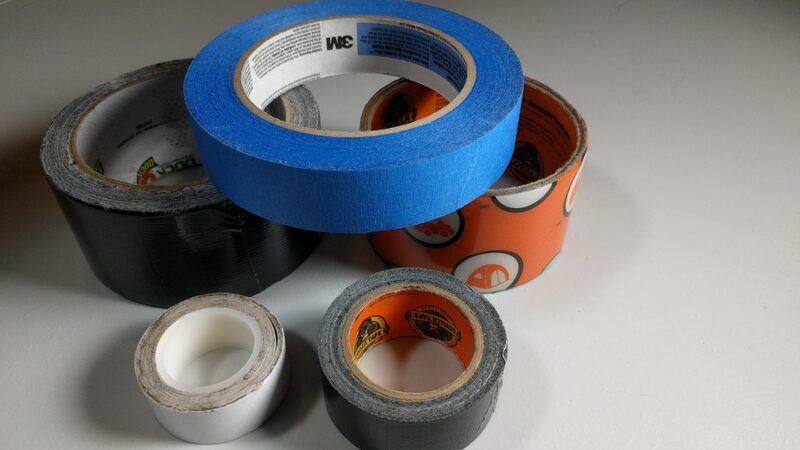 Various types of tape. Clockwise from left: Duck brand duct tape, 3M blue painter’s tape, clear Gorilla Tape, small black Gorilla Tape, and double-sided fabric tape. Electrical tape is not pictured. Ask me what items I use most frequently as Takeo, the Cosplay Repair Guy, and tape is likely number one on the list. The reason for that is that it’s amazing for quick fixes and for props when superglue (see below) isn’t a practical option—such as when the item to be glued is one of the types of foam that superglue can eat away. But let’s go one step further and talk about why I recommend the types that I mentioned, as well as specific brands that work better than others. First off is 3M blue painter’s tape. This is a type of masking tape that is especially useful for hanging up signs around a con, assuming the con allows posting signs. Most hotels explicitly state that you use this tape because it has a low tack strength and comes off cleanly without residue. Other than that, it’s not particularly useful in a cosplay repair context, but it’s great if you’re helping advertise for a room party or other event. Alternatively, you can use the blue color of the tape as part of your cosplay or prop as blue accents, or use it for masking out parts of your cosplay when using paint. If you need to make a precise color-based aesthetic fix on a cosplay or prop, use this coupled with a Sharpie to get clean sharp lines as necessary. Next is duct tape. The old adage is that duct tape can fix just about anything, and there’s definitely some truth to that. (Just please, please, don’t make a wig out of it. It’s just not a good idea.) Basic gray or black duct tape has a myriad of uses and, due to its strength, can also be a quick-and-dirty fix for tears in fabric—just close up the rip by taping up the edges on the interior side and it doesn’t show. It’s also great for prop fixing and even prop making. Of course, carrying it in standard roll form probably isn’t the most practical or portable way to keep it on you, but that’s where duct tape’s literal strength lies: you can cut the inner cardboard tube out of the center of a roll of duct tape and flatten it down, and it’ll fairly easily fit in a pocket. Of course, you could also take a length of duct tape and wrap it around your container of choice, such as an empty pill bottle, or around a rigid card, such as an old gift card or business card. It should also go without saying, carrying duct tape every day is pretty handy too. But that’s not all. Duck brand duct tape has the added benefit of coming in many different colors, even metallic colors and patterns. This means that if you go with this brand, you suddenly have a bunch of different applications as far as aesthetics go. If you have a cosplay or prop that’s a specific pattern or color, get the closest matching roll of Duck tape and you’ve got yourself the perfect repair tool for when your cosplay or prop breaks. You can find it at most arts and crafts stores and your local hardware store too, though not all stores will carry all color options. And then there’s Gorilla Tape. You’ve probably heard of the infamous Gorilla Glue, but you may not be as familiar with the tape line. Let me tell you something: for those really strong fixes, Gorilla Tape is hard to beat as far as being readily available in hardware and crafts stores goes. But the best thing about this tape is that it comes in clear form too! That’s right—you can get tape stronger than duct tape  that’s near-invisible. Clear Gorilla Tape gets the most usage out of all of the tapes I use in cosplay repair. It’s so darn useful; it can be placed inside or outside your outfit and works wonders on props, especially if they have a color scheme that would be best left uncovered. It should also be noted that the clear Gorilla Tape is also to tear, so unlike clear shipping tape, you can simply tear it like you would tear duct tape. Oh, and let’s not forget that the duct tape-style Gorilla tape also comes in a much smaller form factor as seen in the bottom right of the image above. That means easier to carry and takes up less room. If you only need black, than Gorilla tape in that form would be much better than Duck Tape. It’s more portable, it’s stronger, and it’s easy to tear. Gorilla tape can be found at arts and crafts stores and hardware stores. Next is fabric tape. Like the name suggests, this is a double-sided tape intended to fuse two pieces of fabric together. The tape itself is actually clear; the white in the photo above is the backing. I personally don’t use it often, but like I mentioned at the beginning, your mileage may vary. Fabric tape has several distinct advantages over fabric glue, something else I carry but isn’t really practical in an emergency repair kit: you don’t need to wait for it to dry, it doesn’t need a craft stick or toothpick to apply, it’s easy to use, and it doesn’t smell like crap. (Trust me—fabric glue smells really bad.) It’s also a viable alternative to a needle and thread that doesn’t require sewing skill and super steady hands to use. Most good fabric tape is even strong enough to withstand machine washing and ironing, so you can also use it as a permanent or semipermanent fix. You can find fabric tape in some department stores, but the easiest place to source it is fabric and arts-and-crafts stores. Next up is electrical tape. Electrical tape isn’t the most useful tape for cosplay, but it still has its cosplay-related uses. In particular, electrical tape will stick to skin, but it isn’t strong enough to hurt when it comes time to peel it off. Obviously, electrical tape is most useful for its intended use in cosplays that use electricity in some form or another, such as an inflator in air suits like Baymax from Big Hero 6 or props that light up or use EL wire, where a short may potentially rear its ugly head. It’s also good for taping shut battery packs for these devices, as it’ll still allow you to easily open the battery pack when you need to replace the batteries. Electrical tape can be found almost anywhere, so it’s not necessarily something you’d probably need carry on you, but it wouldn’t hurt if your outfit requires electricity in some form. Finally, fashion tape is a type of double-sided tape that is used to secure parts of a costume or prosthetic (e.g., fake facial hair) directly and safely to skin without being painful to remove. It works fast, and even though it’s more difficult to stick it to skin with a lot of hair on it, it’s still possible. Most recently, at Daisho Con 2016, I gave a strip of fashion tape to an Afro Samurai cosplayer to attach his prosthetic sideburns onto his face, and it stuck like a charm. It’s also useful for easily securing gauze directly to skin without having to tightly wrap it around something, and it’s especially great for more revealing outfits to prevent unintentional indecent exposure. 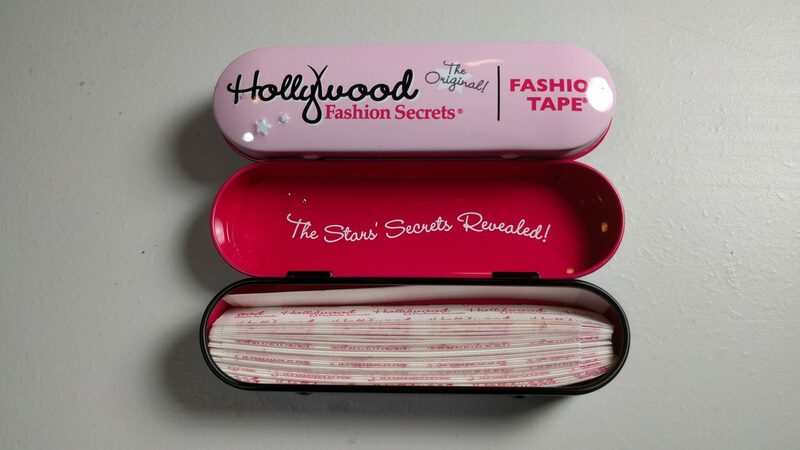 Fashion tape is available at most fabric stores and on Amazon. It usually comes in small tins like those pictured below, making it easy to fit in a pocket. Of course, carrying individual strips may be more convenient, depending on how you decide to carry it. There’s also another similar item that’s more effective than fashion tape, but is a little more involved to use and is a bit more specialized . . . Fashion tape is great when trying to secure parts of your outfit directly to your skin. Spirit Gum is a liquid adhesive that’s purpose built for attaching costume prosthetics and has been used in theatrical applications for over a century. It’s also been used in drag, mainly for shaping eyebrows, and you can use it for cosplay wigs if you’re so inclined. It’s not quite as useful for securing parts of fabric on a costume directly to skin, but as far as prosthetic scars or fake facial hair, Spirit Gum is the best thing to use. Thankfully, you can get Spirit Gum (and remover) in small bottles similar in size to nail polish, and as such, it’s fairly portable. Unfortunately, it’s also more specialized and so is generally only available in theatrical and costume shops, or online. 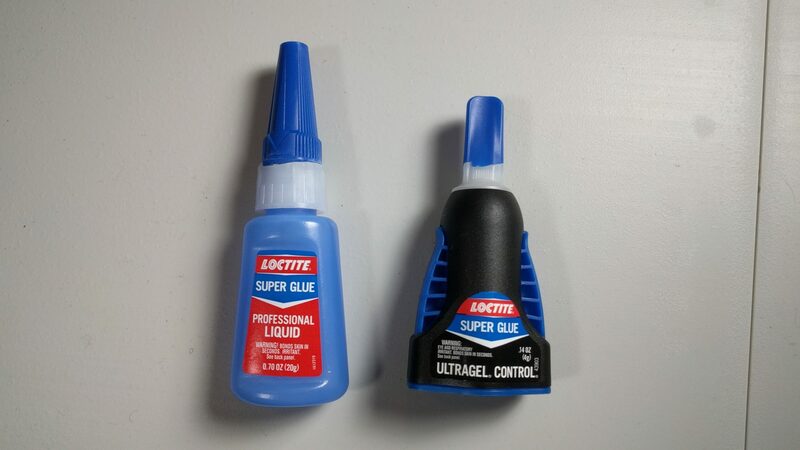 Two different types of super glue: liquid and gel. I’m very fond of Loctite’s brand of superglue, but feel free to use whichever brand you like. I’m going to say this now: do not use superglue to secure cosplay directly to skin! I had someone do that at a con, and needless to say it didn’t end well by the last day. I felt bad, but only half bad, because I’d recommended he used fashion tape instead. But that’s another story for another time. It should not surprise you to know that superglue is great for cosplay. So long as you’re not trying to glue certain types of foam, superglue will just about bond anything, and bond it very strongly—it’ll be permanent, and most of the time waterproof and weatherproof. Heck, depending on what you use the superglue on, it could very well outlast the overall durability of the rest of your cosplay. But you should also know that there are two useful forms of superglue: liquid and gel. Both are easy to find and are available in hardware stores and craft stores, though it’s generally cheaper at hardware stores. Liquid superglue is great when you’re making a very small or precise repair on a small surface area and need the tiniest amount of glue as possible and for it to dry as fast as possible. It’s great for props and masks that are made of thicker and more rigid materials, such as clay or porcelain. Liquid is also faster to apply to a surface than gel, since you’re not fighting the consistency of gel form in a squeeze bottle. The biggest weakness of liquid is that you can’t cover a large surface area, such as the end of a broomstick or the handle of a walking cane, without using a lot of it. Also, in the example of a cane, if there is a gap between the handle and the shaft of the cane due to some decorative or aesthetic embellishment (it’s more common than you think), it’s not going to make contact to adhere correctly. It’s also easier to make a mess with liquid superglue than gel, as it flows quite easily. I’ve gotten superglue on both my gloves and my fingers before, and it’s never fun trying to get unstuck. On the other hand, gel superglue is useful when you require more control, and it’s easier to spread around on something that has a larger surface area without using too much of it. Because it’s also thicker, it’s easier to use for filling in gaps if you accidentally break something and lose a tiny piece. The gel is much better for larger prop repair and is a better alternative than hot glue as it’s significantly less messy and requires less prep time. The weakness of gel is that your hand is going to get tired squeezing that tiny little bottle—the stuff is surprisingly thick, and it can be a pain sometimes to squeeze the right amount to get it into the correct place without your hand shaking from the strain. It’s easy to not get enough because you’re fighting the thickness of the gel, so you can end up with not enough for a fix. Conversely, you might accidentally squeeze too much of it because of the straining, and it might ooze out when you stick your items together. Again, excess superglue is bad; it’s called superglue for a reason. While superglue in both forms is easy to use and very strong, bear in mind that it gives off fumes that are toxic, and the fact that it dries very quickly can be both a blessing and a curse. Also, to emphasize again, don’t get superglue on your skin. It’s an irritant, and I shouldn’t have to tell you that if you stick two fingers together, it’s extremely painful to get them separated even with acetone or nail polish remover—and it’s not hard to accidentally superglue your fingers together, given how fast superglue dries. If you do accidentally do get superglue on your skin or glue fingers together, soak the affected area with warm, soapy water and carefully work it out. You can also use nail-polish remover to remove it; just wash your hands thoroughly afterwards, as acetone itself is also a skin irritant. If you get superglue on your clothes or outfit in a place you shouldn’t, acetone or another nail-polish remover will get it off (mostly), but it may discolor it. Keep it away from the eyes, and don’t huff the stuff. As with any tool, use superglue wisely and carefully, and you should be fine when repairing your cosplay with it. 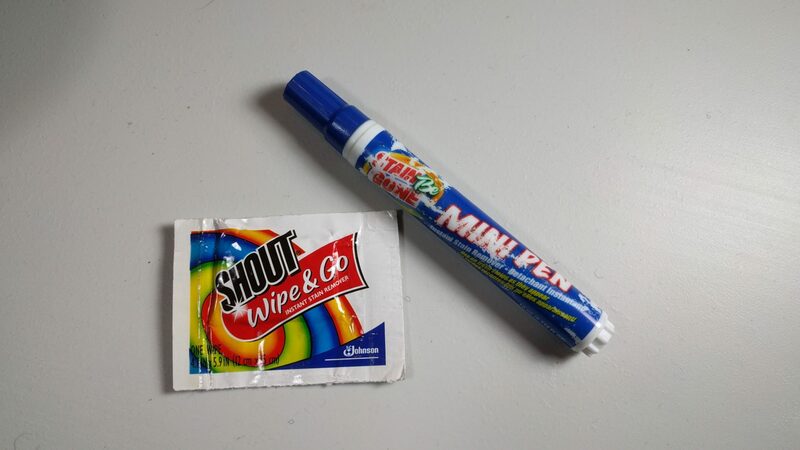 Shout Wipe & Go stain remover and a well-used Stain Be Gone stain remover pen. Stain removers are pretty straightforward in how they work and what they do. Have a stain from an accident? Pull out a pen or wipe, apply, let dry, and no more stain. Super useful, as well as super portable and easy to carry. While I could recommend bleach pens, they generally only work on white and will wreak havoc on any colors, especially dark shades. (Never use chlorine bleach or bleach pens on black clothes!) Because of that, I recommend sticking with the stain remover pens and wipes. What’s not so straightforward is that any Amazon search will yield many different brands of stain-remover pens. While the well-known Tide to Go pen would be an obvious choice, it’s worthwhile to note that what may work well for one person may not be so for someone else. Always try products on a test piece first. I’ve had good experience with removing Sharpie marks from a fursuit using the Stain Be Gone pictured above, but Tide or Lil’ Bully may work better for you. Don’t be afraid to experiment, and once you’ve found one you like, buy lots of them. Stain remover is handy to have in your day-to-day life, but is also a lifesaver for cosplay. On the other hand, Shout Wipe & Go is just about the best stain-remover wipe on the market, mainly because it’s the only stain remover wipe on the market. Don’t let that put you off, though, because while pens are great for spot stain removal and small areas, these textured wipes can cover a slightly larger area. And as a repair man, I can attest to just how well they work. The trade-off is that they’re very concentrated and quite . . . moist, meaning they do require some drying time. But the spot will look amazing once it’s dried off. I’ve seen Shout wipes remove dirt and mud from a kigurumi with ease, and I usually take several packets with me on the road when I’m touring as a musician. I’ve used one to remove sweet onion sauce from one of my favorite gray shirts long after the sauce had dried. And using them couldn’t be simpler: tear open package, grab premoistened wipe, wipe on affected area, let dry, and bam! Stain’s gone. There’s one more major advantage to the wipes over the pens: the packages are small and flat. That means that you can very easily carry multiple packs of Shout wipes in your pocket, badge holder, or other carrier of choice without them jabbing into you. 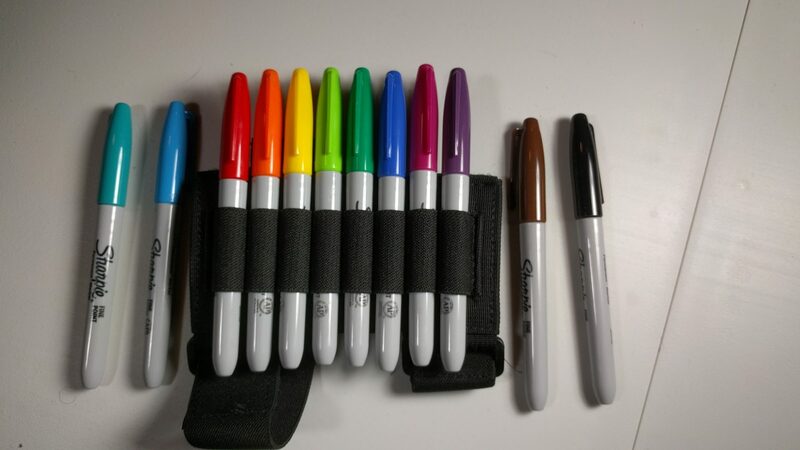 My rainbow of Sharpies. If you’re wondering what they’re stored in, that’s a forearm rifle ammunition carrier. I had to get creative. Sharpies are surprisingly useful for cosplay, and not in the ways you might think. But let’s cover the obvious first: Sharpies are great if you want to get autographs from guests of honor or give contact information to a fellow attendee to foster a new friendship outside of a con. Sharpies are writing tools, and they obviously can be used as such in many different, but pretty straightforward, applications. But what I bet you probably didn’t know is that you can use Sharpies to dye a synthetic cosplay wig. But what about other unconventional applications? Well, Sharpies are very handy for touch-ups on props and outfits, and if you get a full-color set like the one pictured above, you can touch up blemishes on your cosplay with a near-perfect match to the original color. Alternatively, you can combine Sharpies with one of the types of tape mentioned above and do a simultaneous aesthetic and functional repair in one go. Just remember that Sharpies are permanent markers, so if you accidentally get it on your cosplay, you’re going to need a stain remover to remove the stain. Of course, the previous entry on stain removers will quickly fix that. Finally, while I don’t recommend this, you can also use Sharpie as a means to create a temporary tattoo. The reason I don’t recommend it is simply because Sharpie is a permanent marker, and although it’s not permanent on skin, it’s going to take a while (a long while) before it completely goes away. But hey, cosplay does take some dedication, and if you’re that dedicated, I won’t stop you from using Sharpies that way. Just don’t forget if you have a day job to return to post-con. A pack of makeup-remover wipes. 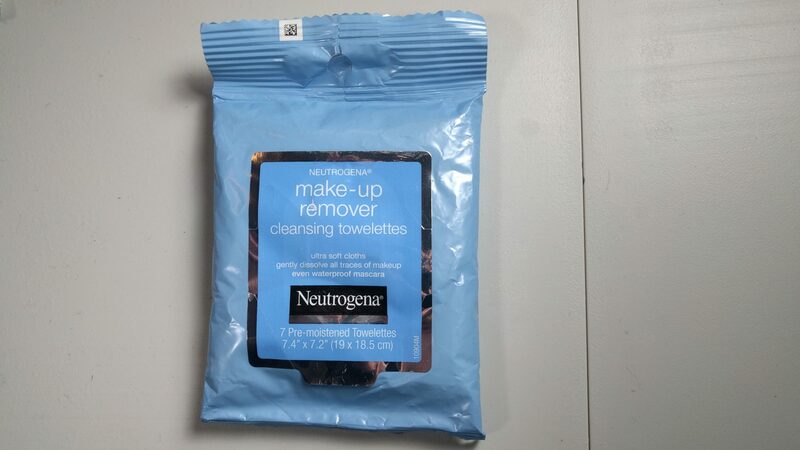 Makeup remover generally has one job: it removes makeup. There isn’t much for me to say other than it’s easy to use and easy to carry on you, especially if you buy single wipes rather than a bottle of liquid or cream. What I do want to cover briefly, however, is how makeup sealer plays into removal. For the Homestuck fans out there, it’s generally recommended that you use makeup sealer on your makeup to prevent it from running. The key, though, lies in the type of sealer you use. If you use water-based sealer, then makeup remover will easily take off your makeup without much hassle. But if you’re using oil-based sealer, good luck, because standard makeup remover won’t work without a lot of towels, a lot of makeup remover, a lot of water, a lot of elbow grease, and an inhuman amount of willpower. Otherwise, makeup remover comes in many different brands, solutions, and packaging options. You can get all-natural remover, or makeup remover without specific ingredients to mitigate potential allergies. And also remember that certain types work better for different types of makeup. Figure out which one you like and what works, and carry that one type. It’ll be quite handy. A wide-tooth comb and two hair picks. Great for styling synthetic wigs for cosplay. Those of you who know a thing or two about wig styling will know that using a wig brush with metal tines or a loop brush is the best thing to use for styling synthetic wigs without ruining them. But hear me out here: wig brushes, even the folding ones, just aren’t all that portable. Or if they are super portable, they’re not very good. 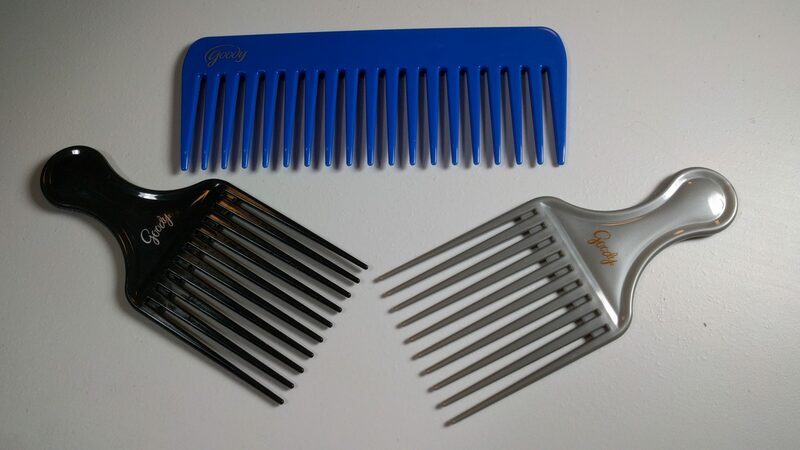 On the other hand, wide-tooth combs and picks are generally flat, so they can fit in a back pocket or wallet, and they work almost as well without ruining synthetic wigs. On top of that, they’re very easy to clean compared to wig brushes, which can take some time and effort. If you used Got2B Glued or Gorilla Snot to style your wig and the comb ends up caked in it, simply run it under some water and apply a little elbow grease and it’ll be clean again. Try that with a wig brush! Of course, knowing which type of comb to get and how far apart the teeth should be set isn’t as simple as it should be. My recommendation is the wider and further apart the teeth are, the safer they are to use on synthetic wigs. Just remember to be gentle and to always start at the ends of the hair and work your way upwards when detangling your wig; if you tug too hard or start at the top and work your way to the ends, you run the risk of no longer having a wig, at least not in one piece. Finally, remember that synthetic wigs don’t behave like real-hair wigs. You can’t use the same cleaning products on a synthetic wig that you would on real hair wig—at best, they won’t work, and at worst, they’ll ruin your wig. If you need to style using heat, always set it on the lowest possible setting. 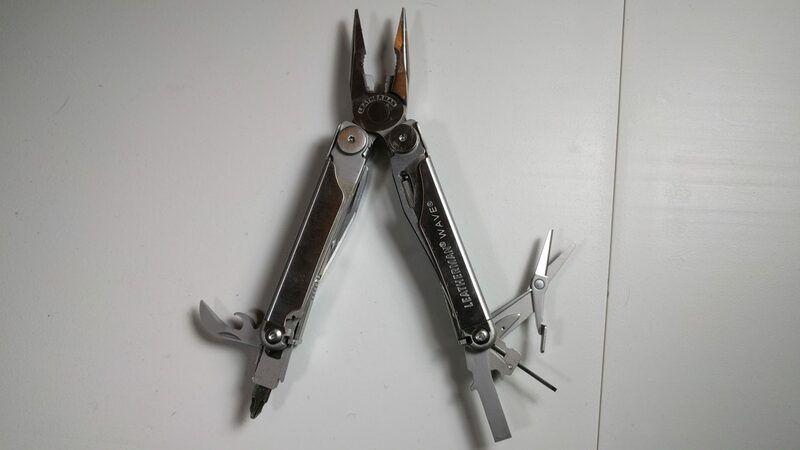 A Leatherman Wave multitool, partially open. This thing is amazing, but it’s best carried in a belt pouch due to its relatively large size. Hand tools are wonderful things. If you have complex props or wear a cosplay that uses screws, bolts, or other hardware, a toolkit with pliers, screwdrivers and bits, scissors and cutters, and other similar hand tools is a lifesaver. Having tools specific for your cosplay can help keep you in the cosplay game without eating into precious time that you could be using to make new friendships and snapping some awesome cosplay pictures. And a lot of tool kits come in their own handy carrying case. However, even the nice portable kits still aren’t super portable. Then there are multitools, quite possibly one of the greatest inventions on earth. I can’t even begin to list the built-in tools that these things generally come with; just know that you can use them for almost everything, and they’ll do a good job at whatever you throw at them if you’re aware of what they can and can’t do. There are a lot of them out there, most of them good. If you have a cosplay that you feel would benefit from having a toolkit or multitool, then my suggestion is to run a web search on the best of the best, then get the one that fits your needs most closely. I can’t recommend any one multitool or toolkit over any other because every cosplay is different—each one has different methodology and materials for building or fixing, as well as a different amount of space where the tool can be stored on your person. Because of that variation, this is one of the only items on this list for which I simply cannot give a clear-cut brand recommendation. A disclaimer: always carefully check and read the rules of the convention you plan on attending to make sure you’re able to carry one of these multitools. Most cons don’t mind, but it never hurts to double-check the rules, especially if your multitool has sizable sharp blades. If the rules don’t explicitly state whether or not you can have one on you and you’re not confident that you can, contact the con to make sure, and be sure to explain why you’ll carry such a tool. This is a USB power bank to recharge devices on the go. I own another one of these, but the thing is so big that it wouldn’t be practical for someone to carry unless they had really deep pockets. Smartphones are great for taking pictures at conventions, but like any portable electronic device, they have limited battery life. And unlike the flip phones of old, the majority of smartphones won’t even last a full day on a single charge if you’re using it a lot—as you would, say, during a convention. In addition to photo taking, smartphones are also what we generally use to connect with others at conventions, so it’s important to stay charged. Or maybe it isn’t so much the phone itself you’re worried about but other USB-powered devices, such as wireless speakers or Bluetooth headsets. Of course, you could carry a spare charger on you, but then you still have to find an outlet, and sometimes they’re occupied to the fullest. Not a bad idea, but there’s a better solution. Enter the USB power bank. These things are awesome, and I’ve had to resort to using one at some busier cons, like CONvergence. It’s essentially a higher-capacity rechargeable lithium-ion power cell with a USB power output—you can think of it as a portable, finite USB charger or power outlet. (Some companies actually produce power packs with standard three-prong outlets, but they’re very expensive and usually relatively large.) Power banks are very easy to use, and with a little common sense (i.e., don’t drain the battery completely and don’t abuse it) they’ll last you for a very long time. They’re very straightforward, and despite having realistically only one function, are arguably one of the most important items on this list—one that I would universally recommend to carry if you can, regardless of what your cosplay is. It’s not a direct cosplay-repair tool per se, but since most of us (barring photographers) use our phones to take pictures at conventions, having a power pack like this can be a lifesaver. And if your phone is fully charged to make calls, send texts, and connect with other con-goers and cosplayers, it can literally be a lifesaver. As for brands, my recommendations are Anker, RAVPower, Jackery, and TravelCard, and the average price for one ranges from $25 to $50. 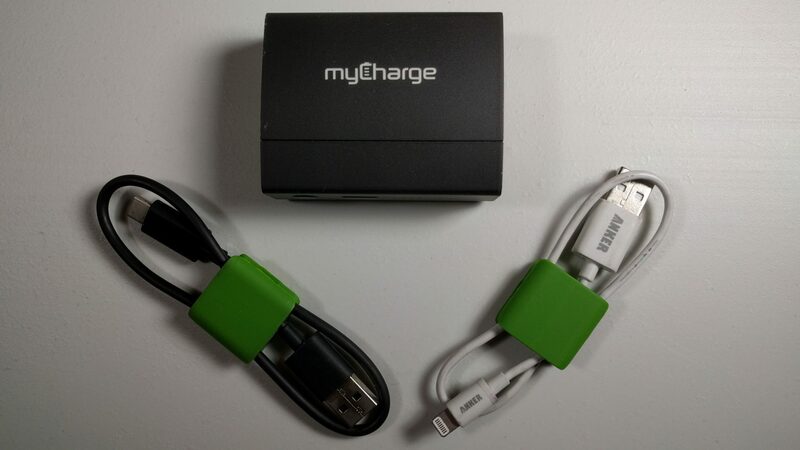 The higher the milliamp hour (mAh) rating, the higher the charge capacity, which means you’ll have more charges for your device at your disposal. And if you buy a power bank that doesn’t have integrated cables, don’t forget a spare cable too (my recommendation is, again, Anker). The TravelCard is the most portable of the bunch, able to fit in a wallet and not much larger than a credit card, so if you don’t have a whole lot of room or carrying capacity, that’s the one to get. The tradeoff for its small size is that it also has the smallest capacity, but for an emergency, it’ll get the job done. Most power packs with a three-prong AC adapter are too large to carry easily, but if you require one, then my recommendation would be the ChargeTech portable power outlet. Any others just aren’t quite as good, and those with more capacity are much larger and heavier and harder to carry around. iPhones, Androids, and USB-C all behave a little differently to different power banks, and different power banks can have different output voltage and amperage. Again, I suggest doing research on which ones are the best and choosing one that fits your needs best based on charging capacity, device charging speed, and physical size. 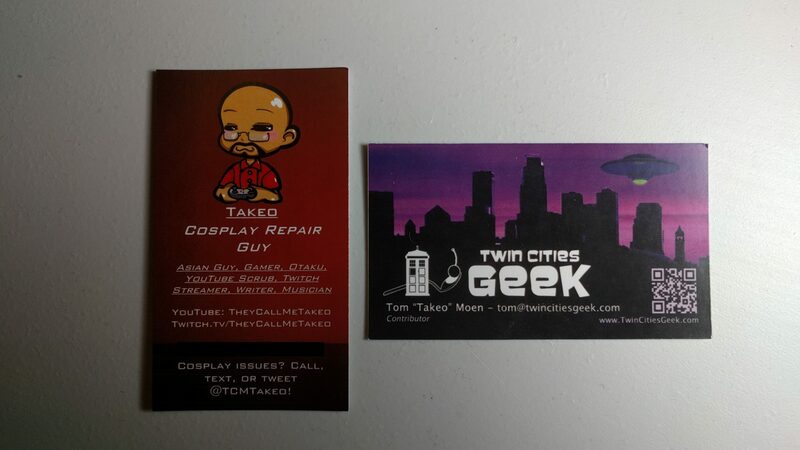 Here’s a pair of business cards that I give out at conventions: my “geeky” one and my Twin Cities Geek one. Here’s a completely optional but great item to carry on you at a convention with your cosplay: personalized business cards. Again, this isn’t necessarily a cosplay repair tool, but it’s still very useful to have and a great way to connect with other cosplayers and con-goers. I have two that I carry with me to every Minnesota-based convention that I attend, pictured above. On the left is my “geeky” business card that has links to my YouTube gaming channel and my Twitch channel, and lists my Twitter handle and phone number. This card in particular is very useful when I’m acting as the Cosplay Repair Guy because it has information on how to reach me should someone’s cosplay encounter a malfunction. I generally leave a stack of those cards at operations (or whatever respective name the con calls their operations department) so that people can get a hold of me. On the right is simply my Twin Cities Geek business card, because shameless plug, you know? The cool thing about business cards is that you can essentially use them to show off without coming off as a show-off. If you’re artistically inclined, you could make your own artwork to grab someone’s attention on the business card. It also makes for a handy method to connect with people post-con, as they’re more likely to remember you if they received a physical document with your information on it. And if you’re uncomfortable giving people your direct contact information or real name, which is totally understandable, you can instead put links to a Facebook page, dedicated cosplay email, or similar link. Honestly, though, I’m sure most people understand how business cards work, so there’s not a whole lot more for me to say without restating what’s already been said. Now, all these items are quite useful for quickly fixing cosplays while on the go, but unless you have a lot of pockets (and, in the case of needle and thread, a way to carry things safely) you’re going to need a container for everything. Luckily, there are a lot of cool ways to carry those items, and of course, don’t just limit yourself to suggestions I’ll include here. You could go my route and devote an extra MOLLE pouch on your tactical vest or chest rig to holding your items. Of course, on more revealing outfits, things get more complicated. On such outfits, you might end up having to break your repair kit apart into smaller packages and strategically attach them around your outfit, or secure them in a prop. Of course, that’s going to require a bit of devotion and creativity. 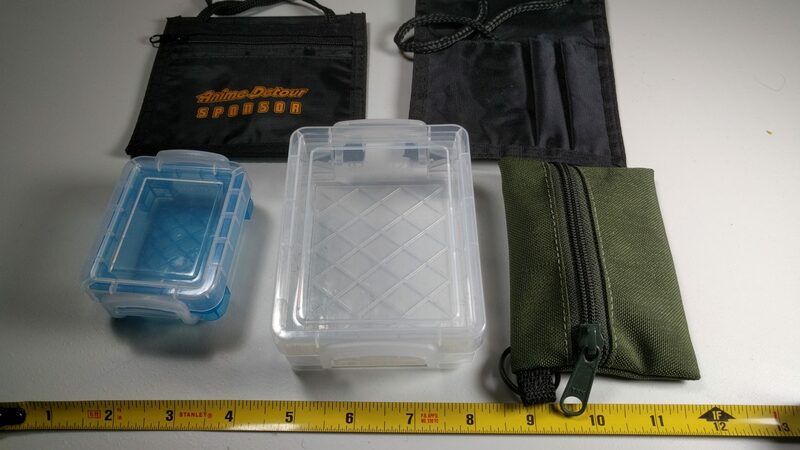 Alternatively, simply having a small box, case, pouch, empty pill bottle, or bag with the items attached to a carabiner can work just as well. These are just some of the methods in which to carry cosplay repair items. Clockwise from top left: Anime Detour’s neck-worn sponsor badge holder, a generic neck-worn ID holder, a tactical-style nylon pouch with a keyring from Fire Force USA, a medium-sized craft container, and a small crafts container. Tape measure for scale. At the same time, some cons have sizable badge holders (such as the Anime Detour badge holder or the generic ID holder pictured above) that have just enough room to carry just everything you’d need for a very basic cosplay repair kit and a writing utensil or two.. Alternatively, you can also go with a more DIY solution and make a pouch from scratch or sew in an extra hidden pocket on your cosplay to carry your repair tools out of sight. In the case of a carry case, don’t be afraid to let your imagination and creativity take over to find an interesting, clever, or simply convenient and out-of-the-way method for carrying your supplies. Remember that this isn’t a definitive and absolute list of every tool to carry for every emergency cosplay repair kit for every cosplayer. I’ve simply presented some suggestions to spur some ideas for the cosplayers out there. Every cosplay is different, and as such every cosplayers’ needs are different. While I can go on and say that regardless of where the cosplay came from or what materials they’re made of they generally break the same way, there are simply too many variables involved to say that one solution or tool will work for every single scenario. When putting together your own repair kit, consider the materials of your cosplay and props and plan accordingly. You probably don’t need every single item on this list—you might not event need any items on this list at all! On the other hand, there may be something not included here that’s absolutely critical for you. It all comes down to how your cosplay is made and with what materials. If you’re reading this and have a suggestion to add into a toolkit, by all means, post a comment and suggestions. The goal here is to help other cosplayers in the community, and few things are more frustrating at a con than when your cosplay malfunctions after you spent so much time and/or money getting it together. And of course, if you’re at a Minnesota anime convention and need something more specialized, or you don’t have any repair tools at all, you can always find Takeo, the Cosplay Repair Guy, roaming the con and lending my tools, know-how, and mostly steady hands to malfunctioning and breaking cosplays and props everywhere. Just look for the flashing EL wire! Tom is a professional Christian hip-hop DJ, nerdcore fusion artist, multi-instrumentalist, anime fan, YouTuber, and Cambodian American geek. 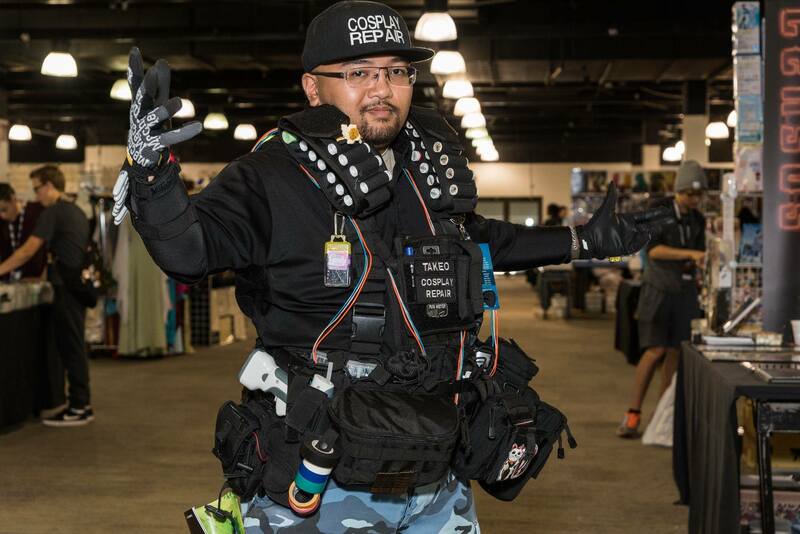 He formerly patrolled conventions as Takeo, the Cosplay Repair Guy, but as of 2018 he’s taken a hiatus to focus on creating geeky music.